This past weekend we hosted our first round of houseguests. I must admit, I was pretty giddy at the idea of this new type of hostessing. I tweeted to see if I could round up some ideas of what I could do to ensure our guests were comfortable and felt special. Allison of Cirque du Sweet gave me a few great ones, including suggesting fresh flowers in their room and freshly baked cookies upon arrival. I picked up some sunflowers, and decided to try out Jacques Torres' secret chocolate chip recipe, dubbed the best chocolate chip cookie recipe by the New York Times (can't wait to share that one!). I also knew we'd need to provide breakfast and coffee all 3 mornings, as well as snacks, beer and wine for the afternoons. I opted for easy options 2 out of 3 times (bagels and lox, then those ready-to-bake croissants I showed you from Trader Joe's), and ended their stay on Sunday morning with this scrumptious Blueberry Buttermilk Breakfast Cake. This definitely made our guests feel special. 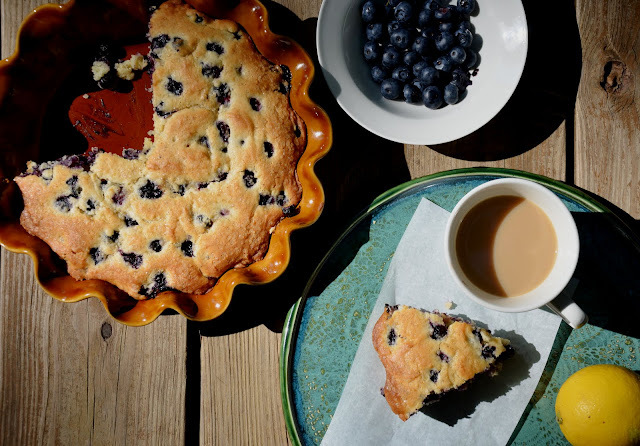 The house smelled wonderful when they walked down in the morning, and the fresh blueberries in this not-too-sweet cake brought summer to the breakfast table. 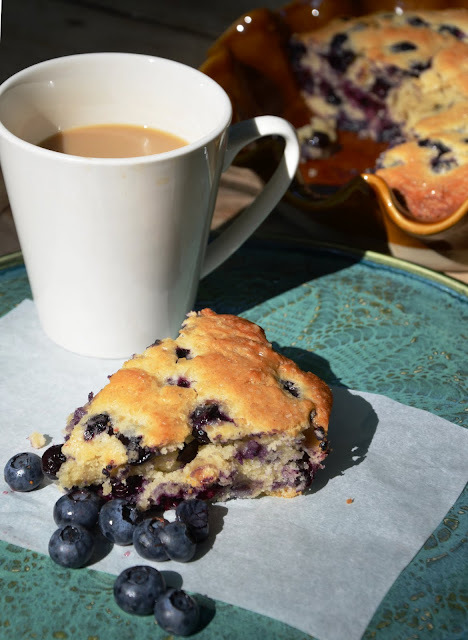 You don't need a special occasion to make this breakfast delight; I actually think it would be best to use this dish to make a special breakfast out of an ordinary day. It's simple to whip up and something the kids would enjoy helping to make. 2. Add sugar and lemon zest to a mixing bowl or bowl of a stand mixer fitted with the paddle attachment and rub together with your fingers until the sugar is moist and fragrant. Add the butter and beat until light and creamy. 4. Grease a 9-inch square baking pan (or something similar) with butter or coat with non-stick spray. Spread batter into pan. Sprinkle batter with coarse sugar. Bake for 35-45 minutes, until a toothpick comes out clean. Let cool a few minutes before serving. Um, can I come be your house guest this weekend? I love that baking dish! Love those fluted edges! Oh, I love it, too! It's an Emile Henry pie dish (which also comes dipped in red or white glaze!). His line can be found at Williams-Sonoma. this looks really interesting, especially because i'm always looking for new brunch options that are a bit different from the traditional quiches + frittatas. this looks wonderful!